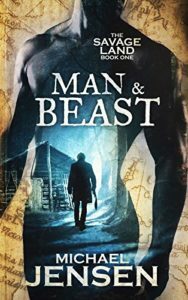 I read Man & Beast by Michael Jensen some fifteen years ago when it was released as Frontiers (it’s a book that is still on my shelf in hardback). I loved in then and I loved revisiting this riveting piece of gay historical fiction as it’s being re-released. The book takes place in 1797 as 24-year-old John Chapman is on the run as he’s been found out to be gay. He tries to escape with his lover, a general, but he loses him and heads off into the frontier on his own. Just as he’s about to give up in a harsh winter storm, he comes upon a blockhouse with a lone settler in it. As the two become reluctant roommates, it seems John has stumbled onto the place he was looking to settle. Unfortunately, the man John’s falling for–and who he thinks is falling for him–isn’t exactly who he seems by the time spring comes around. John takes off again and this time does land in a new settlement, with just a few hearty souls so far looking to create a town. While John just wants to be left alone, he ends up involved in town activities and is being pushed to marry–the last thing he wants. Even out here though, John finds someone he’s attracted too–the brother of the local preacher. As John and Palmer try to hide their relationship, a lot of action goes down in the little town of Franklin including a man from John’s past whose come with vengeance in mind. This book is packed with a lot of action and suspense. John is always trying to outrun some aspect of his past, while at the same time trying to find a mate. He wants a partner, but he’s scared to hope that such a thing is even possible given the major and the man from the blockhouse. Franklin is a bit of mystery too with a lot of subterfuge going on. Man & Beast was a thrill to read and I’m glad I had this re-read because I thorughly enjoyed it. Jensen packs so much detail into his stories, about John and the struggles of the frontier along with the suspense of what John gets himself into that you can’t help but turn the pages. Coming up in January, Jensen releases Man & Monster, the second book in what’s now known as The Savage Land series. I originally read this as Firelands and I’m looking forward to picking this one up for a re-read as well. NOTE: I received a free ebook for an honest review for Jeff & Will’s Big Gay Fiction Podcast.